Compliment slips allow you to provide a client with “your compliments” when they receive your products or other materials. Being a third of the size of a letterhead, they are the ideal alternative to a letterhead when you just need to provide an informal note or just to say ‘thanks’. Most commonly used as an enclosure for other materials such as brochures, compliment slips provide you with an easy effective way of increasing your brand exposure by spreading your name and brand elements such as your logo, in addition to providing notes of appreciation to your clients, customers or colleagues. 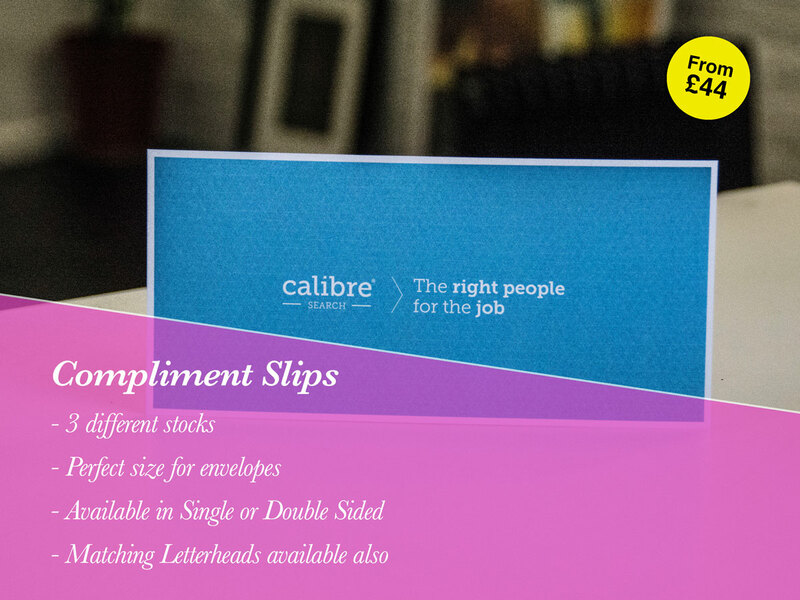 Your Compliment Slips can be printed both single and double sided. Delivery time for Compliment Slips is 3-4 working days for orders placed by 16.30 with print-ready artwork. Prices below for single sided, full colour Compliment Slips. Price includes VAT. Prices above are for single sided / full colour Compliment Slips. Standard delivery time is 3-4 working days for orders placed by 16.30 complete with print-ready artwork. Price includes VAT. All of our Compliment Slips are standard UK size – 210mm by 99mm. What Stocks do you print Compliment Slips on? Can I order matching letterheads? Yes, you can order letterheads at the same time to get matching stocks and design.